I’ll be honest, this bread turned out pretty amazing on the first try, which rarely happens when I am creating a brand new recipe, but I guess we all get lucky sometimes. The only thing I really changed from my first attempt was to add a little more chocolate. I only put about 4 oz of bittersweet chocolate in the loaf on my first try and doubled it for my next try, but you can adjust based on how much chocolate you want in your loaf. The bread itself has a really lovely crust. It’s darkly colored and thick with a great chew to it, but the crumb has these beautiful irregular holes with chunks of chocolate spread throughout. 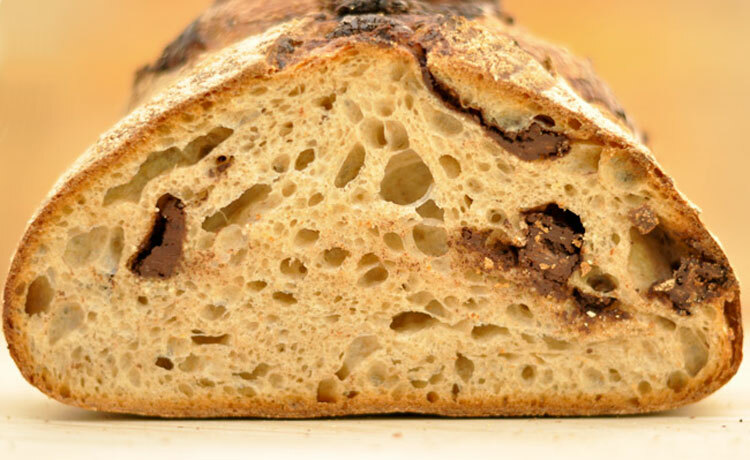 The sweet chocolate mixed with the sourdough create a nice balance that makes for a perfect treat. Once the bread has cooled enjoy it as-is, or lightly toast for a little extra crisp (my personal favorite). Enjoy! I always feed my sourdough about 8-12 hours before I plan I using it. So I would recommend feeding your sourdough before you go to bed then it will be ready to bake with the next morning. Combine your mature sourdough and water together in a large mixing bowl. Stir together just enough to break up any large clumps of sourdough. Add in your bread, wheat and rye flours along with the salt. Stir the dough together until no large bits of flour are visible. Cover the bowl with plastic wrap and allow the dough to autolyze or rest for 30 minutes. Turn the dough out onto a counter that has only a very light dusting of flour or preferably none at all. Knead the dough for 3-5 minutes by hand until the dough tightens up and smooths out a bit. Place the dough back into the bowl and allow it to rest for another 15 minutes, covered up with the plastic wrap. Turn the dough back out onto the counter and knead for 2 more minutes. The dough will be quite smooth and will pass a medium windowpane test (it will get pretty thin when you pull it, but will tear). Give the dough two business letter turns, one after 15 minutes of rising, and again after 30 minutes of rising. This will develop the gluten in the dough further and will add more air to the dough which will help with those great open air pockets throughout the crumb. Allow the dough to rise at around 75 degrees for 3-4 hours. The time will depend greatly on the temperature of where the dough is rising and how active your sourdough starter is. When your dough has almost doubled in size, turn it out onto a lightly floured counter. Gently press it out into an oval shape. Press half of your chocolate chunks into the dough and roll it up into a log. Then press the second half of chocolate chunks into the log and roll it up again. Then shape the log into a boule or round, being careful not to have the chocolate escape. Place the dough into a well floured dough rising basket, seam side up. Cover the basket with lightly oiled plastic wrap and allow the boule to rise at room temperature for 2-3 hours or until it has swelled considerably and if you poke it with your finger the indentation will remain. If it springs back quickly allow the dough to keep rising and recheck every 15 or 20 minutes. About an hour before you plan on baking, preheat your oven to 500 degrees with a baking stone placed on the middle rack and a cast iron skillet placed on the bottom rack. Turn your dough out onto a well floured baking peel and score the top of your loaf. Quickly slide the loaf off of the peel and directly onto the baking stone. Carefully pour a 1/2 cup of warm water into the skillet below and quickly shut the door. Bake for 15 minutes. Reduce the temperature to 450 and bake for another 25 minutes. Then turn off the oven and keep the loaf in for another 10-15 minutes. Remove the loaf to a wire rack and allow the loaf to cool almost completely before slicing. Not the image I wanted to see when I was hungry. It looks so good! I reckon I could eat the whole thing in about 10 seconds flat! I agree. I always enjoy looking at food blogs when I need a break at work, but then it just makes the day drag on longer with me wanted to get home and try out some new recipes myself.